I have to admit that my knowledge of African culture is very limited and having been recommended this book, I start it for two reasons: to learn more about African history and to read Adichie’s work whose talk on Tedtalk, ‘We Should All Be Feminists’, mesmerised me. Half of the Yellow Sun tells a story of three characters’ lives weaves together in Africa in 1960s. Ugwu is a 13-year-old houseboy who works for a university professor who is full of revolutionary zeal. Almost every night at the professor’s house, his friends dine and spend the night talking about things that should have been done. Ugwu, who comes from a small village, sees his master as God. He worships the professor and tries hard to learn English and be more knowledgeable. When his master announces that a lady will come to stay with them and orders Ugwu to clean the house until it’s spotless, Ugwu is worried. What if he doesn’t like the lady? What if this lady is like one of his master’s frequent visitors, loud and daring? But when Olanna steps into the house and speaks fluent English, Ugwu knows that he lives to serve Olanna. Olanna, a London-educated, bright young woman, abandoned her wealthy family in the city to live with the professor. She refuses to listen to her mother and father, broke up with her rich boyfriend to come to Kano. Of all the people she has talked to, only her twin-sister, Kainene, who gives her support. Olanna has always been the good daughter and Kainene, is the rebellious one. However, Kainene has a really good business instinct and she stays in the city to help their father’s business. When Olanna is sweet and friendly, Kainene is cool and ruthless. In one of the dinner parties the family have to attend, Kainene meets Richard. Richard, the third character in the book, is an Englishman who came to Africa to learn about the country, and later decides to write a book about Nigerian culture. He falls in love with Kainene and leaves his mistress and soon moves in with Kainene in her house in Port Harcourt. Kainene strong personality often leaves Richard in wonder whether Kainene really needs him. Richard is determined to complete his book and go to live in Kano, where he has a house to work on his writing. There, he often visits Olanna and the Professor. He becomes the frequent visitor of the Professor’s late-night gathering. Nigeria has its independence in 1963, but three years later, a bloody coup d’etat began in 1966. Later in 1967, it was followed by a group of Igbo people, including the professor, his friends, Olanna and Kainene, who demanded to be separated from Nigeria and built a new republic, Republic of Biafra. However, Nigeria was not in favour of Biafra and blockade the region from the food supply, caused total starvation and two millions of Biafrans died. In 1970, Biafra surrendered to Nigeria and reintegrated into Nigeria. Adichie illustrates the starvation and the dying people of Biafrans so vividly. Reading it, I could feel the fear of the people, the hope, and then, the realisation that they would never win. She describes the degradation of Olanna’s lives so well that often I thought: wait, it got worse? Reading this book, I learned a lot about a country that I had been ignorant about. I think what strikes as a bit odd in the story is the females. They are portrayed as strong, independent women. I don’t think that there is anything wrong with strong female characters, but often wonder if Adichie tries to instil what she believes women should be rather than what women were really like during those years in Nigeria. When at her Tedtalk she mentioned that even nowadays women in Nigeria were still faced inequality, I wonder what had it really been like in the 1960s. However, this book is dedicated to both of her grandmothers who survived the war, no doubt there were strong women those days. I just wished the female characters were portrayed less-modern but equally strong and a survivor. Another reason I gave it a three-star in Goodreads is that of the drama that messes up the characters’ lives. Often I feel that they are not necessary but looking back, probably they are a good way to illustrate the characters’ personalities when they are facing danger. Half of the Yellow Sun shows that ideology and dream can crush someone mercilessly but it also shows that in a time when one has to fight for her life and her family’s life, to witness the fall of her nation, to be able to smell deaths and to be in constant fear of a bomb falling on her roof, we must go on and forget our personal affairs. 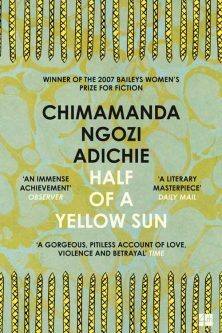 This edition of ‘Half of the Yellow Sun’ was published by 4th Estate.